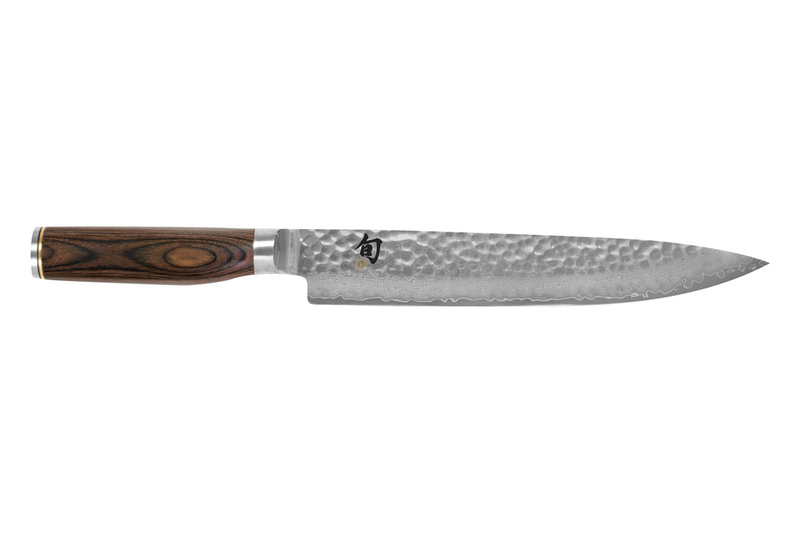 This is a gorgeous new Shun Premier 9 1/2 inch Slicing Knife for slicing your favorite meats. This Premier paring knife from Shun is comfortable and attractive thanks to their new PakkaWood handles in a walnut finish. The handle has a new shape that fits your hand nicely and a walnut finish that looks amazing in your knife block. This Shun Premier parer will keep its razor-sharp edge for far longer than other knives thanks to its super-hard VG-MAX steel core. It's clad with 34 layers of stainless steel too, so it won't rust or corrode. This Shun Premier slicing knife looks amazing and is perfect for slicing your favorite turkey or roast.